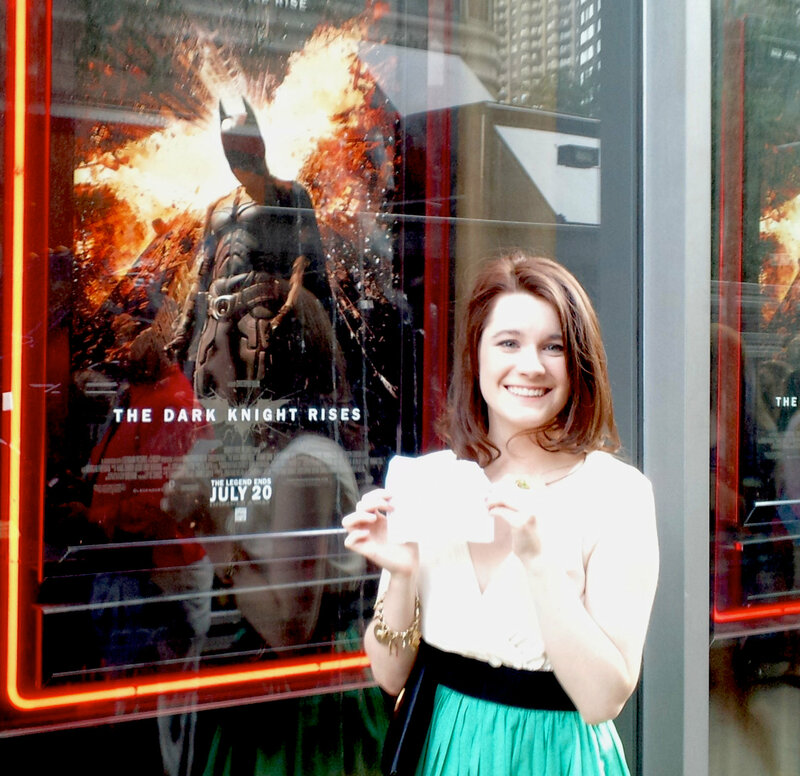 Julia Hatmaker at the world premiere of “The Dark Knight Rises” in New York City. Photo by Laura Hatmaker. Originally published in The Patriot-News on July 20, 2012. Earlier this week, I was transported to Gotham City. Luck had brought me to the comic book metropolis. My parents, siblings and I were extras during the “The Dark Knight Rises” filming in Pittsburgh last year (look for our blurs in the stadium scene). As a reward for our hard work of waiting, screaming and more waiting, there were raffles for prizes. My sister Laura won the grand prize — two tickets to the film’s world premiere and after-party in New York City. Her husband, being a wonderful human being, graciously turned down his ticket so I could have it. On Monday night, Laura and I found ourselves on the red carpet. Or rather, the black carpet. Or rather, by the black carpet. We, the regular people, don’t walk the carpet. Instead, we pick up our tickets at will call through a side alleyway entrance to the theater. Once inside, with tickets in hand, we could observe the carpet activities from a window. Marion Cotillard posed, Anne Hathaway glided and Christian Bale smiled for the camera. Even from our vantage point it was still, mind you, very cool. “The Dark Knight Rises” had two screenings on the premiere evening, both in the same theater. One was an IMAX extravaganza for the who’s who of the movie world. The other, though nice, was a regular screening and was relatively celebrity-free. That was the one I found myself in. The screening was supposed to begin at 7 p.m., so my sister and I made sure to grab our seats a quarter before the hour. We had plum seats, dead center. While other Batman fans continued to pile in, we munched on our free popcorn and drank our free soda. By 7:20 p.m., people were still coming in. An usher explained that the film couldn’t start until everyone had left the black carpet. Director Christopher Nolan and actor Joseph Gordon-Levitt were the cause for the delay. About 7:45 p.m., the screening finally began but a new problem had arisen. With all the free soda we drank, those of us who had been patiently waiting and channeling our inner extra now had to excuse ourselves and answer nature’s call. Throughout the screening, people would get up, shuffle to the aisle and mutter their “excuse me” before shuffling back down and into their seat. I crossed my legs instead as I watched water gush from sewer streams, people splash through tunnels and bodies fall through frozen lakes during the screening. It wasn’t easy, but I made it through the 2 hour, 44 minute film, including the credits. As we left the theater (and its restrooms), Laura and I hopped on a Greyhound Bus waiting outside, with a destination of “Gotham City.” Gotham, it turns out, is the New York Public Library, where a red carpet awaited our arrival. This time, we got to walk it. We went up the stairs and into the marble laden lobby of the library. An orchestra played Beethoven on the staircase. Cater waiters walked by with sushi and Champagne. And, in case you missed a server, there were two bars, one on the first level the other on the second. The third level was roped off. Buffets were on either end of the library and, it should be noted, there was not a book in sight. The main action happened in a hallway behind the lobby, where the crowds were forced to funnel between sofas and couches and could meet-and-greet Morgan Freeman and Joseph Gordon-Levitt on one side. On the other side were Nolan and Anne Hathaway. The middle ground was where the noncelebs moved, occasionally being permitted to talk to the stars by body guards. To read the complete article visit PennLive.com.